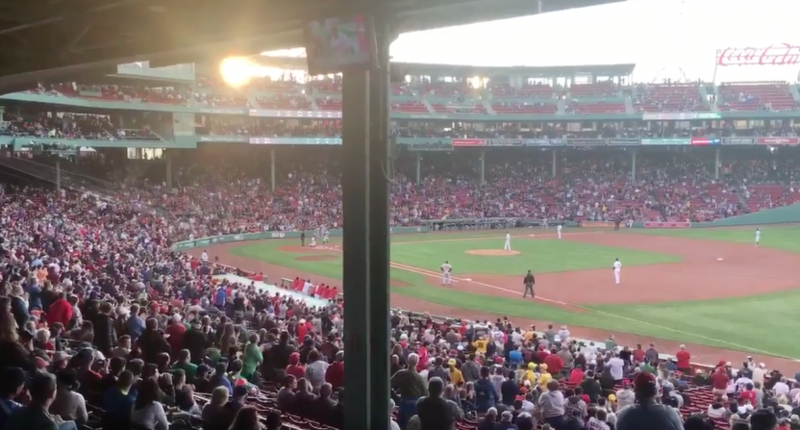 Many Red Sox fans gave Adam Jones an ovation after what happened last night. The previous 24 hours have been a whirlwind at Fenway Park and the city of Boston. A Red Sox fan racially abused Orioles center fielder Adam Jones and threw a bag of peanuts at him. It was definitely a terrible situation and when faced with that, everyone from Major League Baseball to the Red Sox front office expressed their regret for that. But what may be the indelible image out of the entire ordeal, may be the response from Red Sox fans a day later. As Jones entered the batters box in his first at bat, most Red Sox fans gave him a ovation while pitcher Chris Sale stepped off the mound. It would be disingenuous to assume all Red Sox fans are racist but what happened last night put the Red Sox and all Red Sox fans in a bad light. Some decided to have a knee jerk reaction to not believe Jones and to defend the city as well as Red Sox fans. Others used it as an opportunity to teach and while they can’t turn back time and prevent what happened, can show that while that person was a Red Sox fan, Red Sox fans weren’t a fan of him. Those at Fenway tonight chose the latter and in their way of apologizing, is more representative of Red Sox fans than one racist.